Of course, Citroen could not name their new car two years ago the Citroen Airbump, could they? Those lumpy plastic side protectors are what we’re talking about. So ‘Cactus’ it was and why not…people remember that and talk about it; quite clever, really. Citroen have also teamed up with the well know surf brand Rip Curl to create this special edition version. Since the launch, it’s the HDI 1560cc diesel that has attracted most buyers and, after four hundred and seventy seven miles in the car recently, over a period of a week, it’s understandable. On offer is a car that attracts no annual road tax, thanks to its low emissions of 95g/km, and a theoretical combined cycle fuel consumption of 80.7 mpg. It’s gentle 100hp at 3750 rpm has not put buyers off and of course, if they are diesel-savvy, they will know that the 187lb/ft of torque from 1500 rpm is where they will find their true overtaking performance, so typical of diesel engines. The car is by no means sluggish off the mark and can reach 62 mph in 10.6 seconds. Top speed is 114 mph. Citroen being Citroen, there are a few unexpected features, or non-features, about the Cactus. For instance, there is no rev-counter; but, to be fair, do we need one? Not really, I suppose. And, although the car has two doors at the sides, the rear window does not wind down, but only hinges open about an inch; then again, why not, if the rear passengers get enough air-flow that way on hot days? And those kids who enjoy chucking things out of the window in other cars, as I witnessed on the M4 recently, are stymied. The test car had split rear-seats, which are pretty common these days. Also, the rear seat cushions can be easily lifted forward to provide a large and completely flat floor to carry a lot of, or very sizeable, stuff in the back. However, I find myself complaining once again about the complete lack of either a full-size spare wheel or even the lesser offering of a space-saver. There is only one of those puncture repair kits. Call the AA, I say if you’re punctured. The car proved to be pleasant and easy to drive. The engine is refined, quiet and smooth. This is what is expected of a diesel car these days and, considering that there is at least one prestige marque that does not come up to this standard (as written in November 2016). It also charges £10,000 more for its same-sector model, we can only say ‘well done, Citroen’ or PSA, as its group with Peugeot and DS is encompassed. The Cactus performs all the basic driving requirements perfectly well: the steering is easy and accurate; the handling is fine, as is the braking in emergency situations and otherwise. Gear changes are slick enough, with a display in the instrument panel letting you know the best point at which to change. This model adds the switchable 5-mode intelligent traction control which offers a more sure footed drive to the Cactus, especially in the winter months. 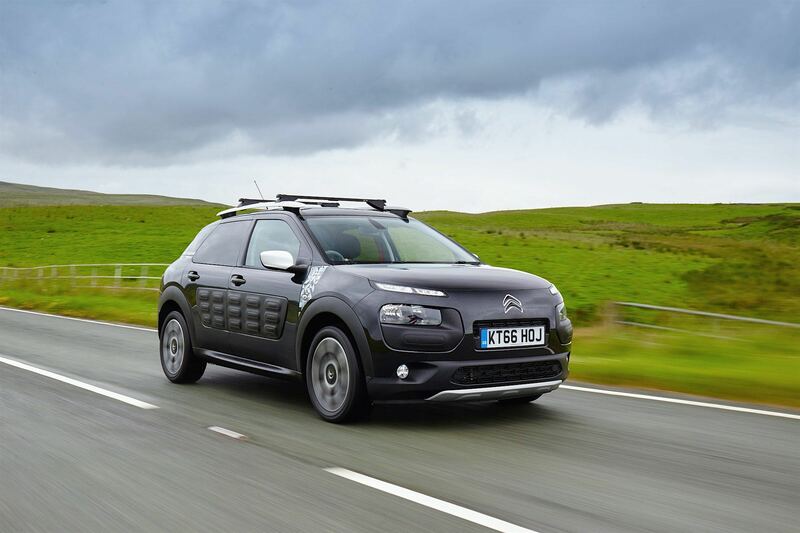 The C4 Cactus Rip Curl is very well-equipped for the basic price of £19570. Standard features for the Rip Curl version are numerous and enable the car to be very competitive in its sector. For safety, these include ABS, EBD and EBA, and ESC, all of which help keep the car controlled in situations where skidding or slipping is imminent, within the laws of physics of course. With all of the above and its sporty looks, it’s no great surprise that the Cactus is doing well.